Mad Monday! I have a super clean and simple card today using Penny Black dies and stamp set. I love bird cages. I have a few at home and garden. 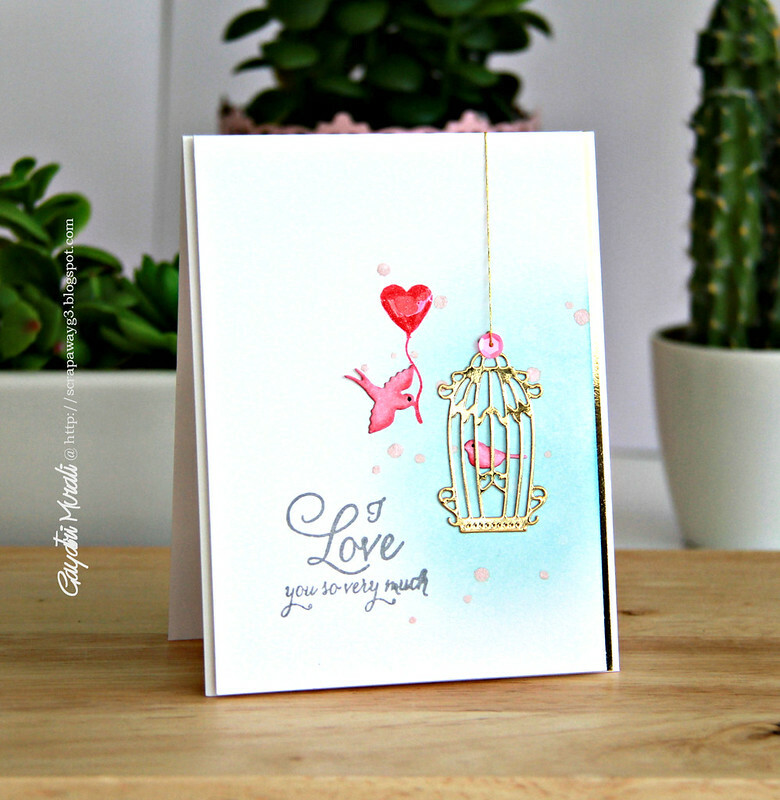 Penny Black new releases have a set of three bird cage dies called Vintage Birdcages. I decided to use the center birdcage die cut in gold foil cardstock. I also die cut the birds from In the Garden die also from Penny Black in white cardstock. I coloured the birds with R81 and R85 copic markers. On the card front, I sponged some Tumbled Glass distress ink , then spattered some clean water and pale pink colourwash from Heidi Swapp. Then I glued the sitting bird on the cardstock with the bird cage on top. I applied glue to the outer edge of the bird cage to make cure the centre of the bird cage bulges a bit for dimension. I then glued the flying bird as if it is coming to the cage. I pocked a hole on the top of the bird cage and threaded gold thread with an Orchid sequin from Pretty Pink Posh added to it. The heart shape balloon is from So Very Much stamp set. I stamped it in red ink, then brush with pink wink of Stella and applied glossy accent. The sentiment is also from So Very Much stamp set stamped in grey ink. I have added a thin strip of gold foil cardstock to this panel before adhered on to the card front with fun foam. 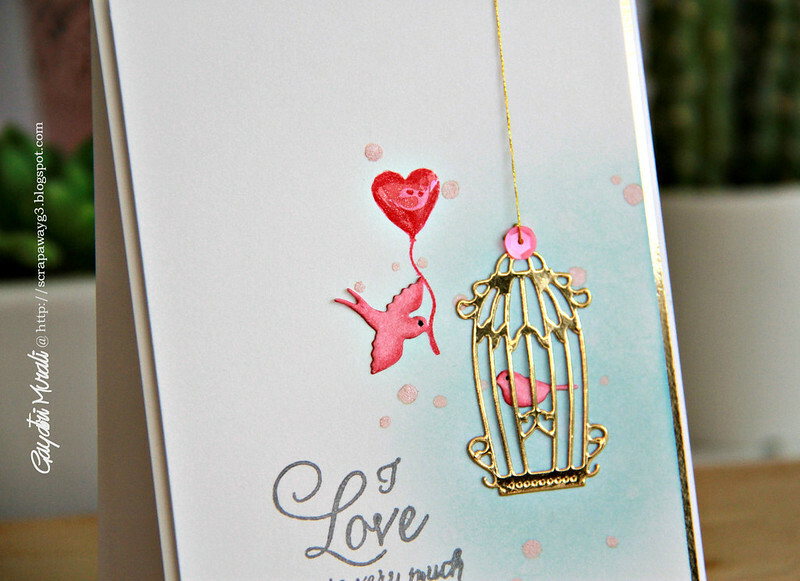 I love the simplicity of this card and also the subtle dimension and texture on the card given by the bulging bird cage, the gold thread, sequins and the glossy accent on the balloon. Here are the three products I have used to make my card. They are all available from Penny Black store.